I became an avid Chicago theater aficionado around the turn of this century, so a couple years after Mary Zimmerman enjoyed considerable success and acclaim for her Lookingglass adaptation of Ovid's Metamorphoses, which would eventually move to Broadway and earn her a Tony Award for Best Direction. But I did catch Lookingglass's reprise of Metamorphoses in 2012 and have seen several other Zimmeman productions, including Galileo Galilei, The White Snake, new stagings of the musicals Candide and Wonderful Town and a world premiere musical adaptation of The Jungle Book, all at Goodman Theatre. I can't say I've loved everything Zimmerman has done, but I greatly admire her talent, including a true gift for whimsy. I found The Jungle Book a particular joy, and rue that the production seemingly hasn't had much of a shelf life (e.g. Broadway) after the Goodman staging in 2013 and a short subsequent run in Boston. And after a 3-year break from working in professional theater, Zimmerman's latest show, The Steadfast Tin Soldier at Lookingglass, is nothing less than a work of genius. extraordinarily imaginative as to keep me awestruck from beginning to end, with a smile plastered upon my face. The Muppet Show. Yellow Submarine. Fantasia. The Lion King musical. Christopher Wheeldon's rendition of The Nutcracker, soon to be reprised by Chicago's Joffrey Ballet. The Wizard of Oz. And a special few holiday classics that bring merriment and mirth when they show up on your TV. The Steadfast Tin Soldier, which in certain promotional materials is subtitled A Christmas Pantomime--as there are no spoken words during the show--already feels like that. Beyond my prior awareness, the story comes from a fairy tale by Hans Christian Andersen, and is inherently infused by abundant imagination from one of the greatest of storytellers. But what Zimmerman and the team at Lookingglass do with it--including scenic designer Todd Rosenthal, costume designer Ana Kuzmanic, music composers Andre Pluess & Amanda Dehnert, puppet designers Blair Thomas & Tom Lee and several others--is simply astonishing in its originality, creativity and sheer glee. 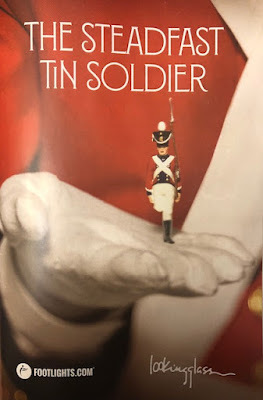 A toy soldier made with just one leg gets wantonly chucked around by a baby, becomes smitten with a toy ballerina dancing upon one leg, suffers--steadfastly--through a variety of misfortunes and indignities before, well, I'll leave that for you discover. So it may well sound like light holiday fare, with its brevity not mandating a trip down to the Magnificent Mile and Chicago's old pumping station, which Lookingglass calls home. 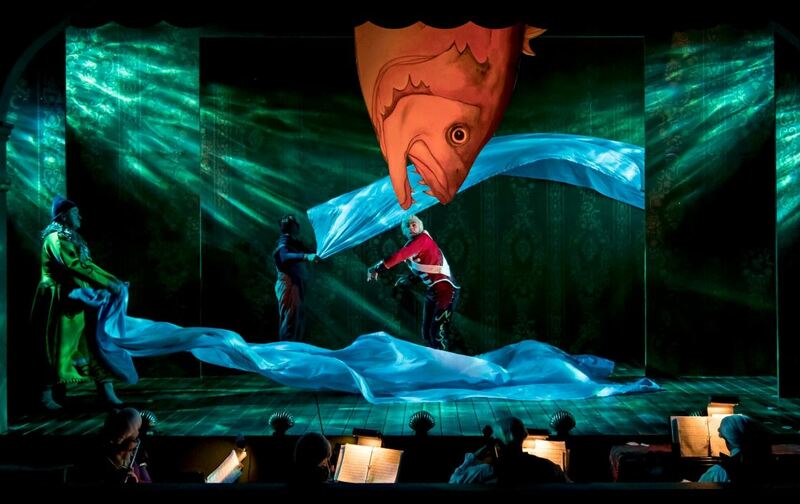 But Chris Jones gave The Steadfast Tin Soldier 4 stars (out of 4) in the Chicago Tribune, and even in arriving with a touch of dubiousness nonetheless, I absolutely loved it. Though I enjoy much Christmas fare, in being Jewish I am not inherently drawn to that much of it, but any and all such reservations are entirely immaterial here. yourself mesmerized by creative ingenuity and beautiful music. The Steadfast Tin Soldier is so good--quite magical, really--that I don't want to tell you too much about it, rather just let you encounter it on your own. 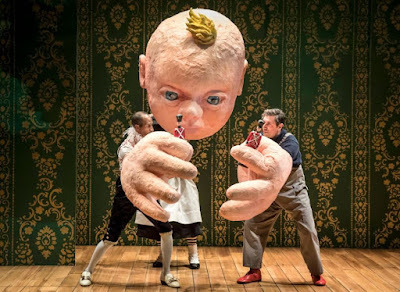 As you should be able to tell from the pictures, sometimes the namesake tin soldier is a small toy--as handled by a baby, who himself is seen in various sizes--but is also played in human form by Alex Stein. 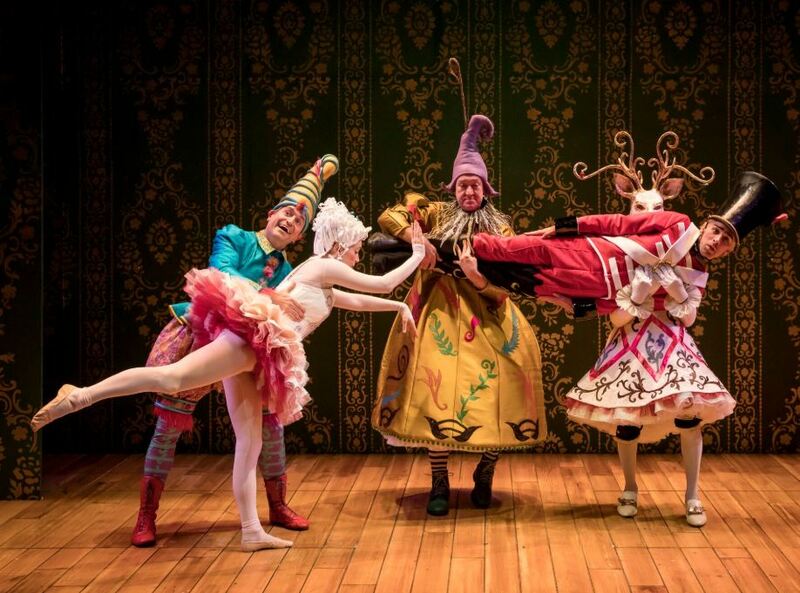 Kasey Foster plays the ballerina, and somewhat astonishingly for all that goes on onstage--including much puppetry--there are only five people in the cast, rounded out by Christopher Donahue, John Gregorio and Anthony Irons, the latter embodying a Goblin sprung from a Jack-in-the-Box. There are also four musicians who play throughout the entire performance, and merely the music would be worth the price of admission. Taking a look at ticket availability and prices, seeing this show shouldn't be impossible, and--depending on the specific performance--relatively reasonably priced. There may also be discounts on HotTix, including for tonight as of this writing. Unless you're a complete Scrooge, I really think you'll love The Steadfast Tin Soldier--on multiple levels--and suggest you don't miss it. Though really, it should become a holiday tradition. Its gifts are that special.